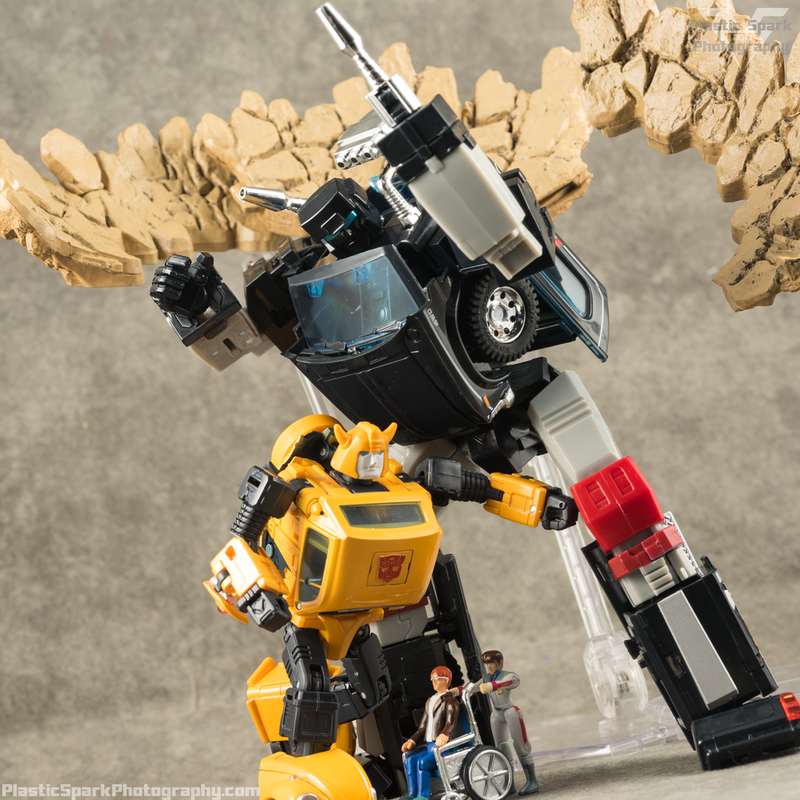 Ocular Max, Mastermind Creation’s off shoot Studio Ox/Masterpiece inspired brand brings us another entry in the “Perfection Series” with PS-06 Terraegis, their take on a Masterpiece style Trailbreaker. 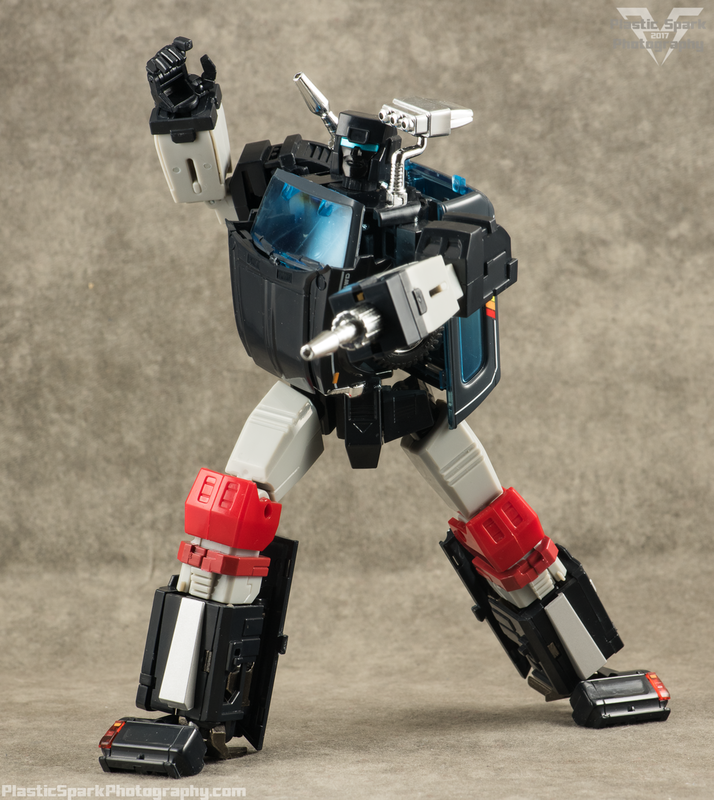 Trailbreaker is a key member of the Season 1 Autobot team and between Ocular Max, Badcube, and soon XTB, not to mention the always looming possibility of an official Takara Tomy Masterpiece, there’s a lot of options to choose from for fans trying to complete the iconic Autobot squad. I was leaning towards the Ocular Max version myself given the great experience I had with Sphinx, their Mirage analogue. As luck would have it I actually managed to win this copy of Terraegis in a contest from a really cool Facebook group called Master Piece Theater. Check them out, they celebrate all types of toy lines not just Transformers! I was very excited to receive this figure and also to win a contest like this for the very first time! You can check out the video here if you’re curious! The contest was to submit a video tour of your Masterpiece Transformers collection! Without further ado, let’s get to it and review this trail cutting trail blazer. I absolutely adore this vehicle mode. I’m a big fan of 4x4 trucks with canopy covers and Ocular Max hit a great balance between cartoon and real world accuracy with Terraegis. The racing stripe deco is gorgeous and the chromed rims with rubber tires really add a nice real world touch to the final product. It does bother me a little bit that the black plastic of the canopy cover doesn’t match the black plastic of the rest of the truck. I’m not sure if it’s a paint finish clashing with a plastic color or where exactly the issue stems from but it is a bit off putting. Ultimately you won’t notice it a lot on your shelf, especially in bot mode but it stands out in photos pretty harshly in vehicle mode. The vehicle mode rolls well and you can open the rear canopy window which is fun. Tailgate gap is a bit lame but I don't see a way around it. There are mounting points on the top of the vehicle to allow for one or both of his launchers to peg in, and you can also peg in the force field generator if you’re so inclined. It would be nice if there were more diverse storage options for his accessories but ultimately it’s not a deal breaker and having a weaponized vehicle mode is always fun. The translucent blue windows are done well but I feel a strong frosting effect, dark backing, or even molding them in opaque plastic may have been the better option as you can see a lot of Terraegis’ inner workings. There is also a bit of a gap between the rear of the roof and his canopy cover, though this seems to vary as many other copies I have seen online are not suffering from this gap. The bottom of the vehicle mode is incredibly clean and Ocular Max did a good job of thwarting “obvious robot syndrome”. I might be partially biased due to my enjoyment of this particular vehicle type but I honestly feel like Ocular Max really nailed this mode nearly perfectly to the point that I see even Takara having a hard time competing with a licensed vehicle mode. Robot Mode is a bit of a mixed bag. I’m going to say that the bot mode is, on a technical level, quite exceptional all things considered. It's very clean and has excellent proportions but I didn’t have that “Wow” feeling that Sphinx gave me the first time I un-boxed him. The plastic quality feels good and he is quite poseable although, again, not to the level of Sphinx. Despite being a fairly boxy, solid character something about the bot mode feels a little bit flimsy in hand. I’m not sure if it’s light materials, or just his general shape but something feels slightly “off”. I wanted to spend a bit of time with Terraegis before drawing any conclusions as sometimes first impressions can leave you with mixed feelings but after a few transformations, and handling Terraegis for my photo shoot I’m still left with the same “meh” feeling when I handle him. I wish I could nail down exactly what it is that causes me such a lack of enthusiasm but I honestly couldn’t really tell you what it is. Maybe my expectations were overblown due to past experience with the brand. From the shoulder, Beyond the wrist... Look out, Evil! It's my fist! 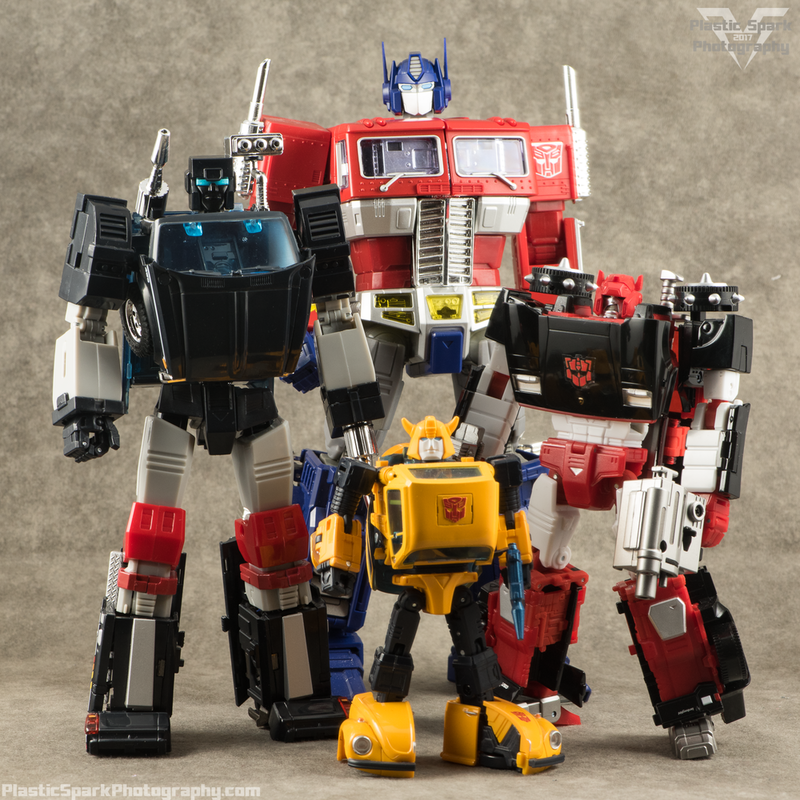 Terraegis stands tall and proud among his peers standing eye to eye with MP Ironhide, and towering over the MP car bots. I love a lot of things about his aesthetic and the ability to compress his center mass for a leaner look, or leave it open for more of a box shape is a great touch that really feels like the kind of detail you expect from Ocular Max. His face is incredibly well sculpted but a lot of detail tends to get lost due to the matching tones of his helmet and face. I would have liked to see a slightly lighter shade of grey used for his face to help differentiate his face from his head. "Aww TeeBee that little pip squeak ain't done you no wrong. Ease up a bit on the lil guy." "So I say to Swerve, you give me the best hi-grade you've got or I'm puttin' a forcefield round ya and launching ya into orbit." Ocular Max also included a toy accurate head with a red visor that is a lot of fun if you want to replicate the original G1 Trailbreaker toy. He can mount laser cannons to either shoulders, and his force field generator can be mounted on his shoulder to replicate his cartoon look or behind his head like the G1 toy. Terraegis’ transformation is so close to just right in terms of complexity and simplicity. You will likely only need the instructions once or twice before you’ve got the transformation mastered but there are some finicky panels that will take some learning to master. Be very careful in following the correct order of operations as it is incredibly easy to break the rear fender panel off while transforming his leg, as well as the wing mirrors if you get ahead of yourself and start transforming things out of order. I also absolutely detest the way the hands extend out for transformation. The fit is so tight that you have to pull on Terraegis' individual fingers, if you're lucky enough to be able to flip a couple out (bring fingernails or a soft plastic pry tool) and I can see this becoming an issue down the road. I would have much preferred a flip out fist stored in the forearm. I haven’t suffered any breakage myself however some close friends of mine who I know are quite gentle with their figures have suffered these 2 particular issues as well as a number of people I have seen posting on Facebook especially about the fender panel. To their credit Mastermind Creations has always been excellent about customer service and replacement parts so if you do happen to suffer a breakage please reach out to their customer service before doing anything hasty. Articulation is above average for similar style figures. I was able to achieve virtually any pose I could think of with Terraegis, with the only real missing element for me being an upward toe tilt for walking poses. His articulation is fairly spectacular considering his size and bulk and he easily trumps similar figures like MP Ironhide when it comes to articulation. From the top down he’s got a 2 way swivel neck similar to most other MP and MP style figures, a full outward swing at the shoulder, as well as the ability to move his shoulders front to back depending on how you like his arms set. He’s got bicep swivels, deep elbows that go well past 90 degrees, wrist swivel and partial hand articulation with a ball joint at the base of the thumb, 2 swivels on the trigger finger, and one swivel at the base of each other finger. His waist can turn a full 360 degrees and he also has a bit of an ab crunch thanks to how he transforms. He’s got universal hips with ratchets for the forward and backward movement. The hip skirts are part of the hips and move with his legs to prevent any sort of collision. He’s got a very tight thigh swivel and double knees if you mis-transform the legs but when transformed properly he has a single joint with just over 90 degrees of bend which is more than enough for most poses. He also has a nice inward ankle tilt and toe tilt downwards. The ankle tilt on my copy is a bit loose but holds in all but the most extreme poses. Terraegis’ accessory load out is fairly simple but effective. 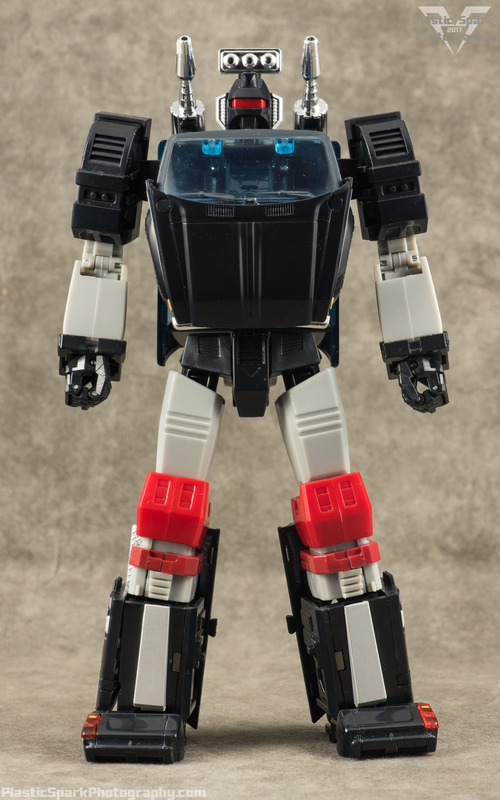 He comes with a replacement G1 Toy head, which is 2 pieces held together with a screw. Swapping the head is simple but as with other head swaps involving threaded screws I am concerned about the long term feasibility of this option. My advice would be to pick a head and stick with it rather than swapping back and forth. Also included are 2 laser cannon type weapons. These can be mounted to Terraegis’ back, shoulders, or disassembled and combined with the 2 included wrist mounts to create his iconic hand blaster. Trailbreaker’s force field generator is included with 2 mounting posts, one for his shoulder and one for behind the head. The generator is held on via a ball joint and easily swapped between the 2 mounts. 2 small clips are included to hold the remnants of the lasers when mounted to Terraegis’ wrists. These can be pegged into his back or his shoulders for some added small blasters/chrome detailing. "Bee! Hurry! Get the humans out of here! The cave roof is coming down!" 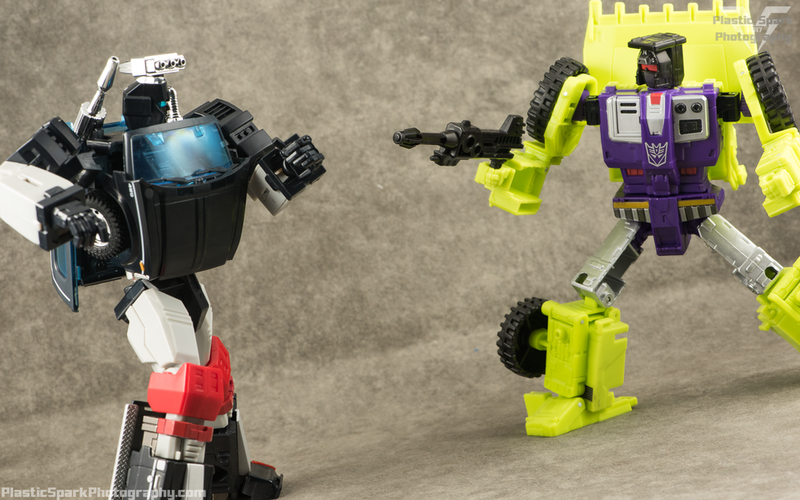 "You got it Trailbreaker! Just keep that force field generator firing! Come on guys!" 2 replacement wing mirrors are included in the event of breakage or loss of the originals. I haven’t had any issues with mine but given that flipping those inwards is an easy step to miss I imagine breakage is a very real possibility. A trading card and tech spec decoder strip are included, similarly to previous releases in this line. You can use the decoder strip to decipher Terraegis’ stats on the back of the box. Yeah it's the same pic, but now you don't need correctional lenses to read the card! The final accessory included with Terreagis is a replacement, Diaclone inspired, Battle Mask variant head for PS-01 Sphinx. The version included with Terraegis is the dark blue coloring of the first release Sphinx, with Artifex shipping with the PS-01a light blue head. I personally have the PS-01a version of Sphinx so I will have to try and swap with an Artifex owner down the road. Terraegis is a perfectly satisfactory toy. He’s got his shortcomings and he’s got some shining moments but at the end of the day, regrettably, I feel like he is best served as a placeholder for the eventual official release of Trailbreaker in the Masterpiece line up. He ultimately will not stand the test of time, at least not in robot mode. I truly feel like the vehicle mode is a rock star, 10/10, absolutely phenomenal but the bot mode just doesn’t live up to the expectations that Sphinx set for the Ocular Max Perfection series in my collection. It certainly helps that this was a contest prize and didn’t put me out of pocket any coin, and for that I again want to thank the Master Piece Theater Facebook group for hosting that contest. I will likely still indulge in a new Masterpiece Trailbreaker once Takara dips their toes in the pool but for now Terraegis stands among my Masterpiece Autobots, and even if an eventual replacement surpasses him in robot mode I’m confident his vehicle mode will remain uncontested in my display. If you're anxious to complete your season 1 crew and you like the look of the robot mode, I would give Terraegis a cautious recommendation. If you like to play with your toys and transform them back and forth frequently I personally think you should wait and see what else comes to market. At the end of the day Terraegis is a very middle of the road, average transforming robot with a vehicle mode that outshines his robot form. He isn't bad, and he isn't spectacular either. 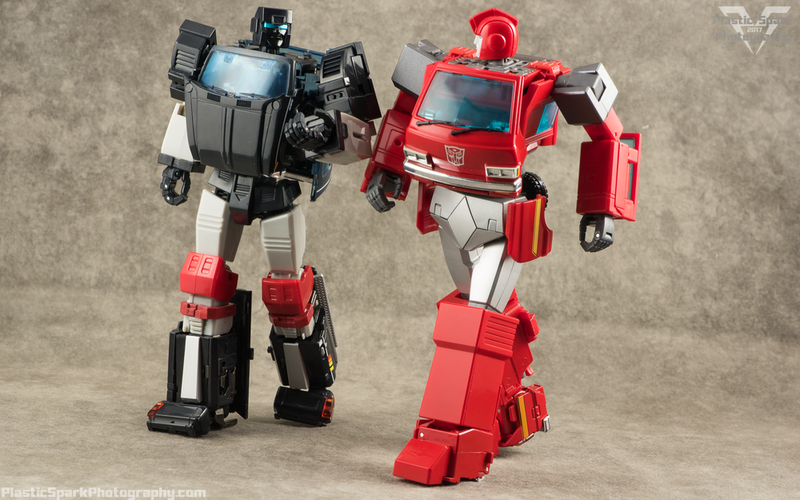 I was smitten with him from photos but I think that Terraegis suffers from the opposite effect that Masterpiece Ironhide does. Masterpiece Ironhide looked strange in photos but feels absolutely wonderful in hand, fun to transform and pose and play with. I feel the complete opposite about Terraegis. He looks great but he is tedious to pose and transform. I lost most of my enthusiasm after handling him in hand, rather than pre-release photos. So take photos and reviews, especially mine, with a grain of salt and try to take any opportunity you might have to physically handle this piece before making a decision to purchase. That would be the best advice I can offer about this figure. 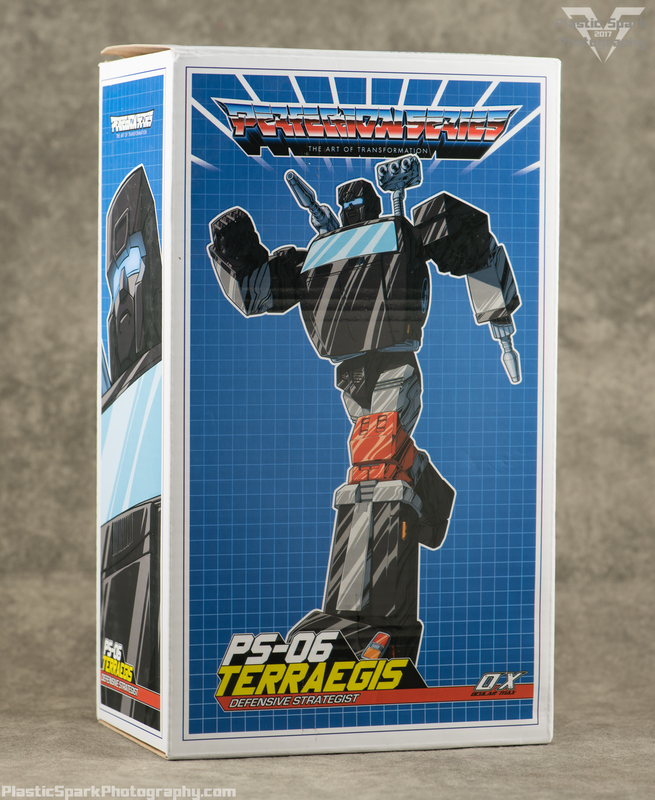 Thanks so much for checking out my review of Ocular Max PS-06 Terraegis!